Jon Ronson follows a trail set by psychic operatives within the United States military and intelligence forces. His findings formed the basis of a movie of the same name. If you stare at a goat long enough, with the right amount of energy, can you stop its heart from beating? This is just one of the questions asked and experiments undertaken at Fort Bragg, in the USA. Nor was it, by any means, the only esoteric training afforded to select soldiers. Remote viewing and invisibility were included in the more benign activities on offer. Psychological torture, and mind games performed upon Arab captives in the War on Terror, represented the dark side. It might all be faintly amusing, if only it wasn't true. I was wearing a tutu and a top hat. We were beside an overgrown mushroom from Alice in Wonderland. We both said hello. He probably wouldn't remember it. There are few places on Earth more prone to the surreal and the bizarre than the Glastonbury Festival. We had a choice of many adventures to undertake, many sights to see and music to hear performed live. I like to go with the flow, in this kind of hippy dream born of the Summer of Love. The flow, in this particular instant, was being directed by an Irish woman displaying far more purpose than is usually associated with those circumstances. "I'm going to see Jon Ronson." Grainne informed me, hurriedly gathering all the necessary supplies for such a targeted expedition. Water bottle, sun hat, rain coat and boots. I'm so easily led, especially by people from Dublin being so focused. I grabbed my top hat, packed some bubbles and debated the wisdom of pausing to add some face paints. "Now. We need to go now." We were halfway to The Park before it occurred to me to ask what kind of band Jon Ronson was. "He's a writer. He's going to give a talk about psychopaths." We had to step aside, off the walkway, to allow a posse of fairies, complete with wings and glitter, to pass by. I considered our quest's end. It seemed fair enough. Grainne appeared back at my side, as soon as the Otherworldly Beings had gone through. "I have to see this. 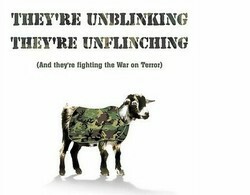 He's the one who wrote The Men Who Stare at Goats." Again, fair enough. At the Glastonbury Festival, it's imperative to believe a whole list of impossible things before breakfast. And I hadn't had breakfast. We grabbed some nachos at The Park and feasted on them over cups of tea and a glass of Pimms. Then we went to hear Jon Ronson speak about psychopaths, because he'd once charmed my friend with a book about goat staring. It was the perfect way to approach him. And Grainne was right. The Men Who Stare at Goats is worth reading. I just wish that it hadn't taken me two years to get around to it. Perhaps the greatest testimony to it of all is that it caused two women to, not only go on a mission across the Glastonbury Festival, but to actually get there without distraction. That is one powerful read. Jon Ronson's book was released alongside a documentary on the same subject. This was long before the movie based on its themes. 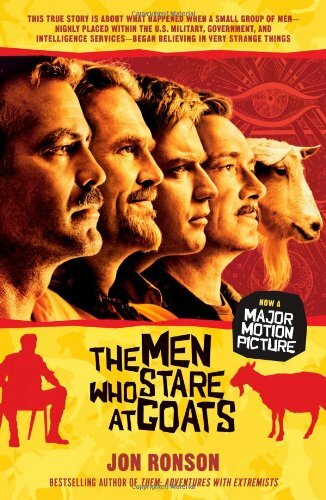 'The Men Who Stare at Goats' is a true story, but it's not the final word on the matter. It's more an introduction and an insight into a very bizarre story. As a Gonzo style journalist, Jon Ronson seeks to investigate and report, not provide conclusive evidence either way. He credits his readers with being able to make up their own minds, based on the testimonies that he has placed before them. In the case of The Men Who Stare at Goats, these stories range from the mildly bizarre through to the extremely disturbing. The records that would prove them are mostly classified and subject to official denial. But where they aren't, Ronson's been in there. The interviews with eye-witnesses and deactivated participants, as well as the documentary sources, add up to a wealth of circumstantial evidence that these things not only happened, but go on happening. It will take until 2030 for the earliest of the official sources to become declassified. This book is a journey through what those records are likely to reveal. And you couldn't make this stuff up. I'm a Wiccan, with more than my fair share of New Age beliefs, but even I found myself expressing a 'WTF?!' attitude at some of the experiments sanctioned in the higher echelons of the Pentagon. There is a chance that it's all a hoax. Ronson doesn't try to direct us into belief or disbelief. But there's a definite ring of truth around the fact that these things were attempted, if not always successfully. And that the hippy ideal of love, truth and beauty did get diverted along some very nasty streams. Incidentally, if you're familiar with the movie of the same name, starring Ewan McGregor and George Clooney, then this isn't just a rehash of that. The movie was inspired by Jon Ronson's book and some scenes are lifted wholesale. But the film is fiction and this is not. The story told on celluloid is only a drop in the ocean compared to the much wider context revealed here. In 1979, a Lieutenant Colonel in the United States Army was given a budget and free rein to explore New Age principles with Special Ops Soldiers. Jim Channon created the First Earth Battalion, where mysticism met martial arts; and telepathy was a sound source of gathering intelligence about the enemy. It was in this secret training ground, nestled in the midst of Fort Bragg, where it seems that a goat was famously stared to death. These stories and more are told in Ronson's book. But Did it Really All Happen? That's for you to decide. For me, it all had the ring of truth for one good reason. It's not the first time I'd heard tell. 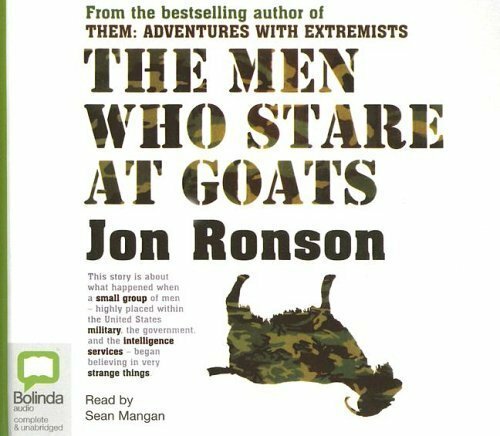 Even if you don't believe a word of what Jon Ronson was told, The Men Who Stare at Goats is still an amusing book to read. He has a very comedic turn of phrase, which will have you laughing aloud, when you're not cringing. Much of the hilarity comes in trying to marry up the previously disparate images of hard-nosed military personnel, and the New Age movement. However, there's a deeply serious side too, which is developed more fully in the latter part of the book. When these exercises and concepts were applied, in remote areas upon people who could not protest, then what used to seem surreal and funny loses the edge of both. He uncovered suggestions that the abuses at Abu Ghraib prison had their genesis in the ideas first developed amongst the First Earth Battalion. It was all about mind control and psychic energy in interrogation; not so much spirituality any more, but torture. In fact, there's soldiers on record in the book stating that the facility itself was partially to blame. It had dark energy, which forced the US military into the extremities of its dark side. Not to mention directives for the same coming from above. Did I believe it? Yes, I did. Search back far enough in my resume and you'll find a listing as a receptionist at the Psychic Research Foundation. I recall sitting behind my desk one pleasant summer afternoon, when a friend of the founder came in. During the course of their conversation they mentioned a mutual acquaintance who had gone missing. He was hiding out because British Intelligence wanted to find him. Why? Because he'd been involved previously with their psychic experiments and it seemed that he'd been too accurate for his own good. It was of mild interest to me in 1995. Thinking back now, in the light of The Men Who Stare at Goats, it seems more than a passing anecdote about an overly paranoid psychic. I can recommend 'The Psychopath Test'. I haven't yet read the others, but now I'm looking to do so too. I did that! Did you find that you also started questioning yourself, just to check if you were a psychopath too? I did. Then realised that if I was worrying about it, I probably wasn't. i really enjoyed psychopath test but it made me look at everyone i meet with a kind of 'Oh Ok ... a possible' attitude. I will have to check out some of this other books too. High ranking members of the US military attempt to run through walls, communicate telepathically and stop goats' hearts with just a look. The bizarre details are actually true.